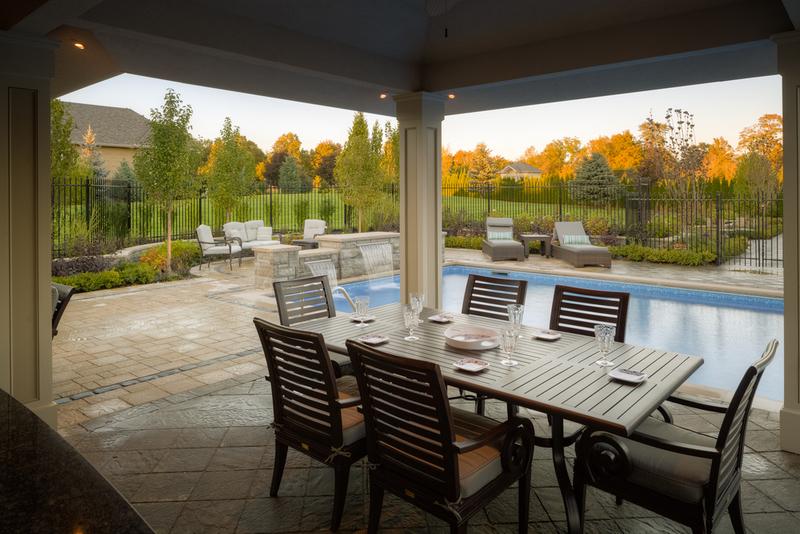 Outdoor living spaces are used for a variety of reasons including dining, cooking, socializing and relaxing. Let Darsan Contracting design your outdoor living spaces according to the activities you would like to accommodate. 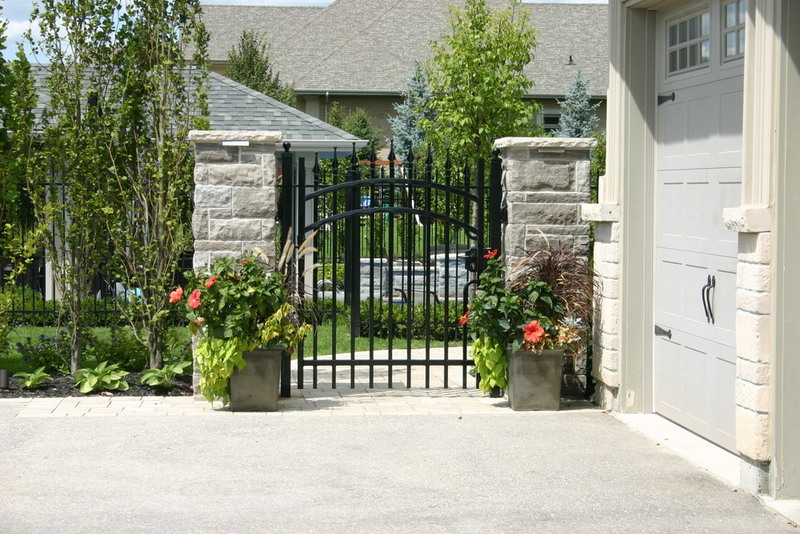 Darsan Contracting offers complete landscape design and landscape construction services. 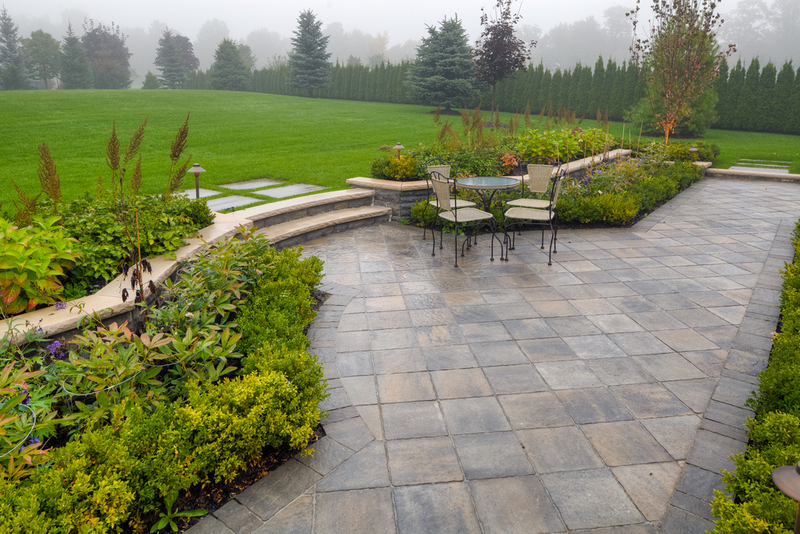 Darsan's experienced landscape designers will provide you with an innovative landscape design that will serve as the framework for your successful landscape. This ultimate landscape design was built for a family with three young children. 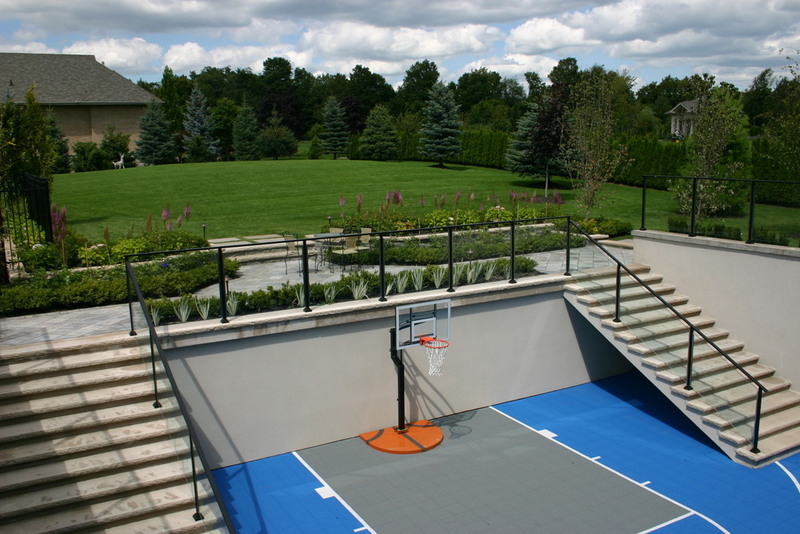 A safe outdoor environment was a key element in the design. The large open space evolved into a luxurious backyard retreat providing functional outdoor living spaces that would be enjoyed by the entire family. A custom designed stone water feature wall with three sheer descent fixtures and LED lights was constructed at the end of the formal 18’x36’ Roman shaped, vinyl swimming pool. The water feature provides great visual effects, and is unique in that it also doubles as a diving platform. The pool coping and all walls were capped with rock faced Indiana coping. All vertical walls were veneered with Owen Sound coursing stone. Darsan’s landscape architect developed the perfect 20’ x 34’ foot print for an extensive outdoor cabana that was proportional to the size of the pool and the property. Our landscape design team collaborated to include all the outdoor amenities that would serve the family’s needs and wish list. 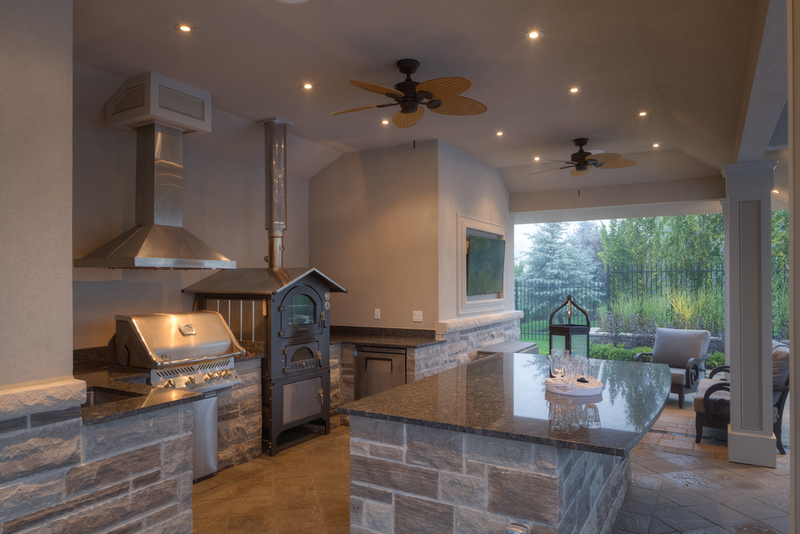 Included in the cooking area were stainless steel appliances, sink, pizza oven, and a food preparation island with granite counter top. A dining area situated at the water’s edge created a dramatic outdoor dining experience. The TV / lounging area and dining area had ample sitting room for large gatherings. 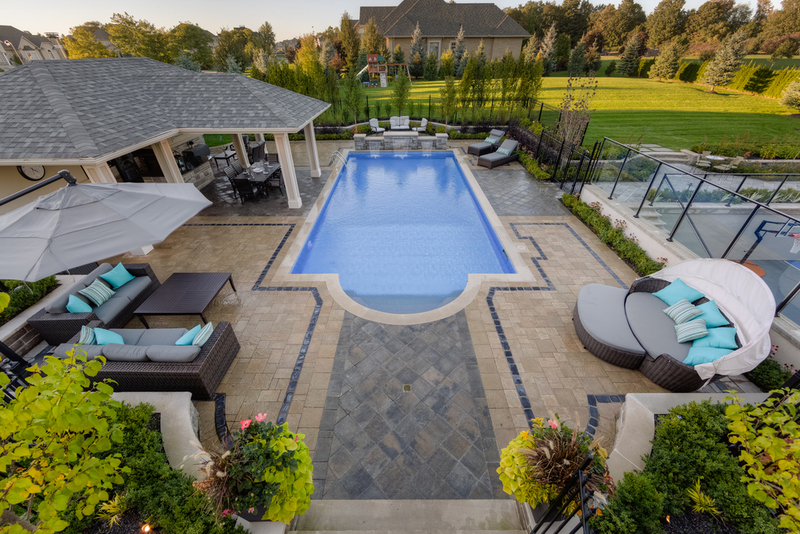 To create contrast and definition between the different outdoor living spaces, we laid the Trafalgar precast pavers in varying patterns and banded with a dark cobble stone border. The distinct open sided overhead roof provided a sense of enclosure, adding such fine details such as semi-vaulted ceiling, pot lights, stucco / stone finish, and square columns. A separate storage room, washroom and outdoor shower area were incorporated into this impressive structure. At night, the mood in the backyard is amplified via strategically placed colour changing lighting, which is controlled along with the waterfall, by a backyard automation system and separate remote control. The landscape was completed with splashes of varying plant material which added colour to the formal planting scheme which gave it, its finishing touches.